Welcome to Old Cast Iron Radiators.com. 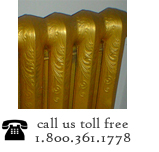 We are a Canadian company that has supplied steam or hot water cast iron radiators for over 100 years. Whatever your taste and requirements, if you are looking to replace your old cast iron radiator, you have come to the right place! We carry a wide range of stunning obsolete vintage old cast iron radiators which can suit your needs perfectly. 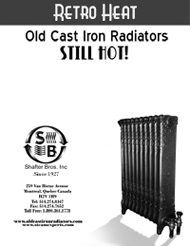 Browse through our web site and feel confident that we are only one phone call away to help you acquire the specific cast iron radiator you need. Customer Service: 1.800.361.1778 Canada & U.S.A.
All Cast Iron Radiator models are available in different Heights, Lengths and Depths. All Cast Iron Radiators for Water or Steam application. All Cast Iron Radiators Radiators are built to size and capacity of heat required for your home. Each Cast Iron Radiators can be sandblasted and painted your color of choice. We use Benjamin Moore high quality paint, we also use Mettalic Paint for a stunning Gold, Silver or Copper finish. Each Cast Iron Radiator is professionally sprayed with 2 coats primer and 3 Coats of your choice colored paint. (1 coat per day) to produce the best paint finish.